Everyone has at least one souvenir sitting on a shelf or hanging on a wall. Why do we buy them? What do they represent? How did the practice start? All these questions and more are answered in this cute little information-packed book. 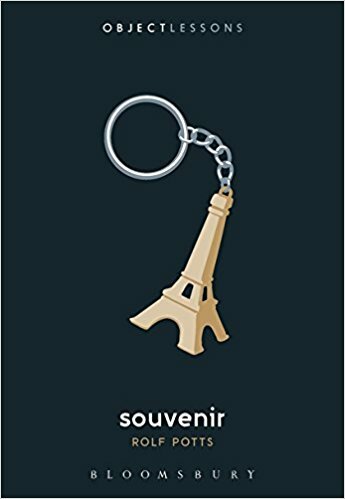 There are three types of souvenirs discussed in Souvenir: physical fragments, local products, and pictorial images (i.e., postcards, t-shirts, keychains, shot glasses and tiny Eiffel towers). Beginning with Christian pilgrims taking a bit of the dirt where Christ walked to Thomas Jefferson peeling a chunk of wood off Shakespeare’s chair, physical fragments began the search for souvenirs. Demand for local products has benefitted cathedrals to African tribes. It has also promoted world trade and knock-offs as varied as shrunken heads made from monkeys, fake hangman’s rope and “Australian” boomerangs made in Bali. How the age of email and the selfie has impacted pictorial image sales is addressed within Souvenir too. In addition to what is used for souvenirs, Souvenir suggests the various reasons that souvenirs are acquired. Both history and culture are explored. A fascinating discussion on an overlooked subject. Souvenir is a great book to read before a trip especially on an airplane, train or cruise ship. 4 stars! Thanks to the publisher, Bloomsbury Academic, and NetGalley for an advanced copy. Souvenir will be published on March 8, 2018.